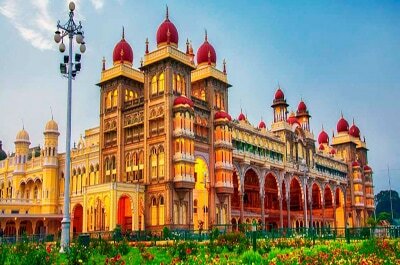 The Palace of Mysore is a historical palace in the city of Mysore in Karnataka, southern India. It is the official residence and seat of the Wodeyars — the rulers of Mysore, the royal family of Mysore, who ruled the princely state from 1399 to 1950. The palace houses two durbar halls (ceremonial meeting halls of the royal court) and incorporates an array of courtyards, gardens, and buildings. The palace is in the central region of inner Mysore, facing the Chamundi Hills eastward. Mysore is commonly described as the City of Palaces. There are about seven palaces inclusive of this; however, Mysore Palace refers specifically to the one within the Old Fort. Built by the Maharaja Rajarshi His Highness Krishnarajendra Wadiyar IV, Mysore Palace is now one of the most famous tourist attractions in India, after the Taj Mahal, with more than 6 million annual visitors. Krishnaraja Wadiyar III was Maharaja from 1799 to 1831. After the death of Tipu Sultan he made Mysore his capital in May 1799 and focused on education, religious sites and donating jewels to temples including Melkote. Chamaraja Wodeyar IX was crowned on March 25, 1881. He was anointed king on the date fixed by the Governor-General. He is credited with founding India's first democratic institutions -"Prajapratinidhi Sabhe" with the Mysore representative assembly in 1881. The zoo was opened to the public in 1902, and now includes a bandstand and an artificial lake. It was given to the Department of Parks and Gardens of the Mysore State Government in 1948. 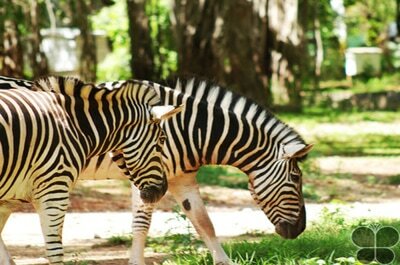 The zoo was expanded first with another 50 acres (20 ha), and then another 150 acres (61 ha) with the acquisition of the Karanji Tank (Karanji reservoir), in which an artificial island has been created as a sanctuary for birds. 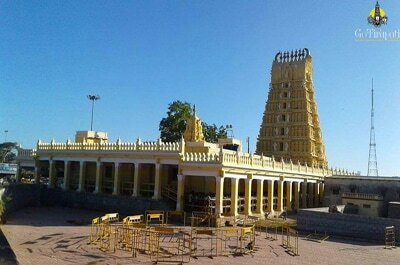 Somanathapura (ಸೋಮನಾಥಪುರ) is a town located 35 km from the historic Mysore city in Mysore district, Karnataka state, India. 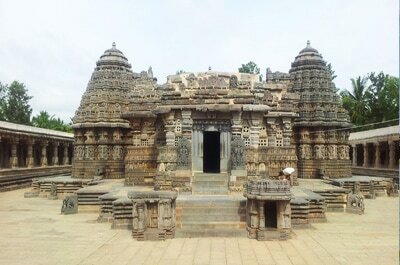 Somanathapura is famous for the Chennakesava Temple (also called Kesava or Keshava temple) built by Somanatha, a Dandanayaka (commander) in 1268 CE under Hoysala Empire King Narasimha III, when the Hoysalas were the major power in South India. The Keshava temple is one of the finest and most complete examples of Hoysala architecture and is also one of the best preserved Hoysala temples. The temple is a trikutachala (a three celled structure), with the three sanctums or shrines connected by a vestibule. The temple is in the care of the Archaeological Survey of India as a protected heritage site. The Chamundeshwari Temple (ಶ್ರೀ ಚಾಮುಂಡೇಶ್ವರಿ ದೇವಸ್ಥಾನ) is a Hindu temple located on the top of Chamundi Hills about 13 km from the palace city of Mysore in the state of Karnataka in India. 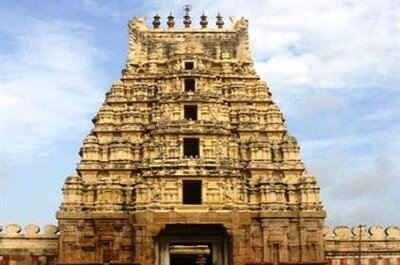 The temple was named after Chamundeshwari or Durga, the fierce form of Shakti, a tutelary deity held in reverence for centuries by Mysore Maharajas.The Chamundeshwari Temple is considered as a Shakti Peetha and one among the 18 Maha Shakti Peethas. It is known as Krouncha Pitham as the region was known in Puranic times as Krouncha Puri. Srirangapatna (also spelled Shrirangapattana; anglicized to Seringapatam during the British Raj) is a town in Mandya district of the Indian state of Karnataka. Located near the city of Mysore, it is of religious, cultural and historic importance.Although situated a mere 15 km from Mysore city, Srirangapatna lies in the neighbouring district of Mandya. The entire town is enclosed by the river Kaveri to form a river island, northern half of which is shown in the adjacent image. While the main river flows on the eastern side of the island, the Paschima Vaahini segment of the same river flows to its west. The town is easily accessible by train from Bangalore and Mysore and is also well-connected by road, lying as it does just off the Bangalore-Mysore highway. The highway passes through this town and special care was taken to minimize any impact on the monuments.